New York – When the Savoy Ballroom opened its doors last Friday night there was a line at the box office which wrapped around the block to get in on the first night reopening. As early as seven o’clock, two hours before opening time, the crowd was waiting to jump to the music of Cootie Williams and the Savoy Sultans. With a limited by law capacity of 1500, the sale of tickets had to be discontinued four times. But still the jitterbugs came. An unexpected added attraction, the world famous Ink Spots sang a few numbers for a more than appreciative audience. And the familiar strains of the swing which the “Home of Happy Feet” was always famous for, kept the Lindy Hoppers happy. About a week after Weegee’s photo was made, the Ink Spots and Ella Fitzgerald recorded Cow Cow Boogie. (Foo-Gee is anachronistic but fun.) 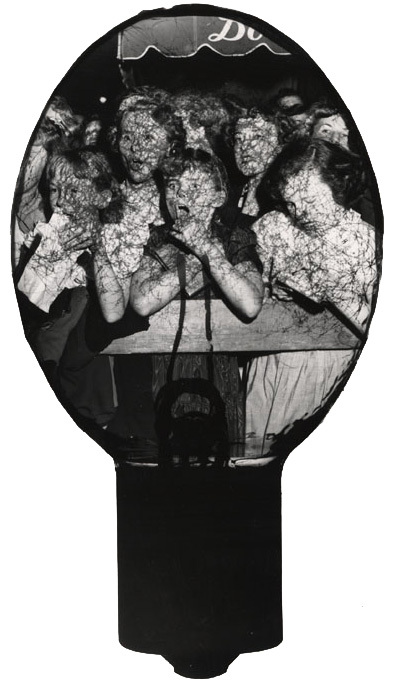 Don’t Believe Everything You Dream was recorded about two weeks after Weegee’s photo was made. This entry was posted in Fans in a Flashbulb and tagged #WeegeesWorkOctober1943, 1943, Harlem, Ink Spots, Manhattan, Naked City, New York, New York City, Savoy Ballroom, Weegee, Weegee's Work in October 1943. Bookmark the permalink.